Elko, NV – Feb 16, 2016 – Lithium Corporation [OTCQB – LTUM] (“the Company”) is pleased to announce that it has signed a Letter of Intent (LOI) with 1032701 B.C. 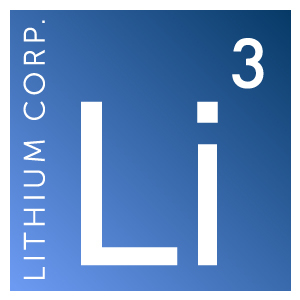 LTD., a private British Columbia company with respect to the Company’s Fish Lake Valley lithium brine property in Esmeralda County, Nevada (the “Property”). Upon signing, pay $100,000 to Lithium Corporation and issue 200,000 common shares of the Optionee/ TSX-V listed public company. On or before the first anniversary of the signing of the Definitive Agreement pay $100,000 to Lithium Corporation and issue 100,000 common shares of the Optionee/TSX-V listed public company. On or before the second anniversary of the signing of the definitive agreement pay $100,000 to Lithium Corporation and issue 100,000 common shares of the Optionee/TSX-V listed public company. Optionee must make qualified exploration or development expenditures on the Property of $200,000 before the first anniversary, an additional $300,000 before the second anniversary, an additional $600,000 prior to the third anniversary, and make all payments and perform all other acts to maintain the Property in good standing before fully earning their 80% interest. Additionally, terms will be negotiated for the Optionee to purchase the Company’s 20% interest in the property for $1,000,000, at which point the Company’s interest would revert to a 2 ½% Net Smelter Royalty (NSR). Optionee may then elect at any time to purchase one half of Lithium Corporation’s NSR for $1,000,000. This current report contains “forward-looking statements,” as that term is defined in Section 27A of the United States Securities Act of 1933 and Section 21E of the Securities Exchange Act of 1934. Statements in this press release which are not purely historical are forward-looking statements and include any statements regarding beliefs, plans, expectations or intentions regarding the future, including but limited to: that a definitive option agreement will be entered into with an acceptable TSX-V listed company or that such company will be able to comply with its obligations under such agreement.